The Straight Downtown Style Park Benches feature a pair of straight-aligned seats creating a comfortable seating area for two. Supported with durable 2-7/8" O.D. 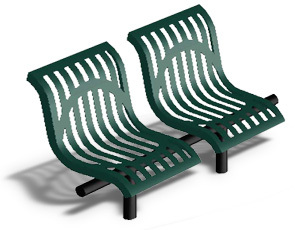 steel legs, the ribbed steel gives the classic benches a modern look. The straight aligned bench seats are finished with a slightly textured matte Polyethylene coat in the color options shown below. Portable, In-ground or Surface Mounts are available, and optional grout covers can be ordered with the In-ground and Surface mounts. 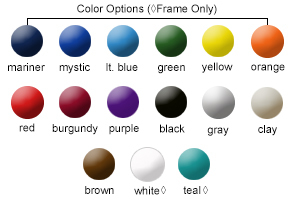 Bench frames and grout covers can be powder-coated in the color options shown below as well.